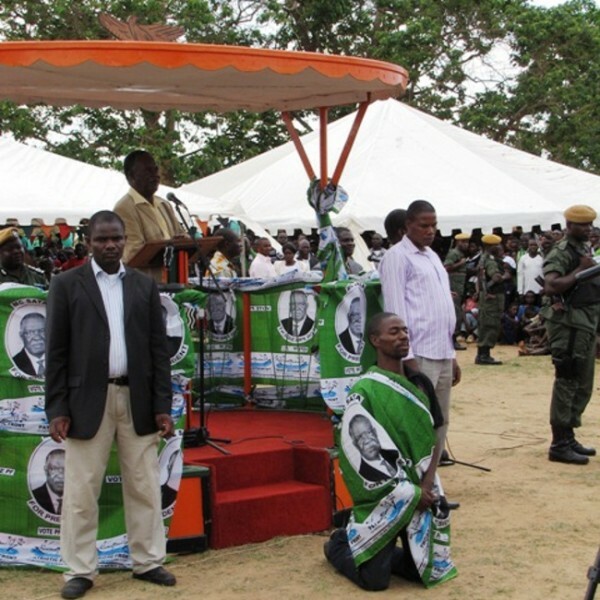 President Michael Sata has left Mufumbwe after addressing two poorly attended rallies. And Sata has told Zambians in Mufumbwe to vote for PF during the forth-coming November 8 parliamentary by-elections if they want development in the area. Sata said if Mufumbwe residents do not vote for the Patriotic Front candidate, Steven Masumba, then the government will take the money to the people who want it. And Sata has accused PF campaign manager in the Mufumbwe by-election Jean Kapata of failing and thereby losing the seat. Sata arrived in Mufumbwe at 10 hours on Saturday but by 19 hours was back in Lusaka. At one of the meetings that had more police officers in attendance than potential voters, Sata told his candidate Steven Masumba to keel down and beg the people. At the other meeting also attended by mainly police officers from Copperbelt and Lusaka, Sata said MMD president Nevers Mumba is jealousy of Masumba because he was dancing with beautiful Congolese woman. He said it was Nevers Mumba who took the photos of Masumba dancing with a dancing queen. He wondered what could be wrong with dancing with a beautiful Congolese woman. Sata said Nevers Mumba’s characters is questionable. He said Mumba started a church saying he would be a Tele-evangelist but did not carry on the important job of serving the lost souls. Sata said Mumba again formed a church and preached under the theme,” Zambia Shall will be Saved” which he also abandoned for a job to satisfy him. But some of few people who turned up to listen to Sata expressed anger and and shock at president Sata’ behaviour. One resident told the Watchdog that Sata’ lack of seriousness is the continuation of his disdain for people of North-western. The resident who said he is a registered voter recalled that it was Sata who once said the people of North-western province are only suitable for cleaning toilets.